Research into bears' ability to make and use tools is already yielding some fascinating findings: they'll do anything for a donut. In a series of ongoing experiments at Washington State University's Bear Research Education and Conservation Center, eight bears are being presented with a serious challenge: how to get their paws on a delicious donut dangling from a string, just out of reach. First, the bears are given a pretty obvious solution; researchers simply placed a sawed wedge of tree stump just underneath the sugary confection to serve as a step tool. Next, the challenge is replicated, only this time the stump is placed further away from the donut and turned on its side. The bears must summon a bit of inventiveness to figure out it can be used to give them a boost, since it isn't obvious. One of the grizzlies, a 9-year-old female named Kio in particular, is proving that her species is quite capable at devising tools to solve problems. "She manipulates an inanimate object in several steps to help her achieve a goal, which in this case is to obtain food," said lead researcher Lynne Nelson. "This fits the definition of tool use." Previous studies have found that grizzlies sometimes pick up rocks to scrape on their faces to exfoliate, which constitutes tool-usages as well, but solving the donut test suggests they possess even more brain power than previously thought. 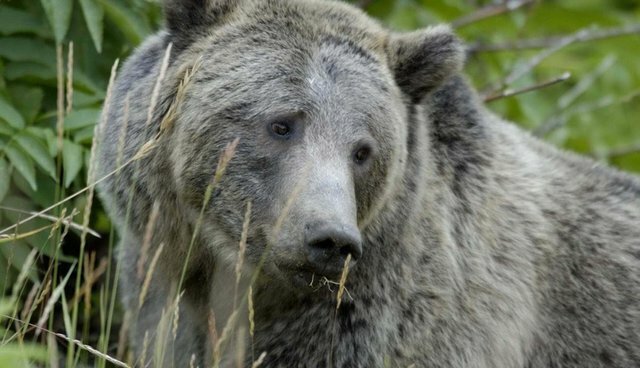 "Grizzlies are smart foragers and they'll work hard to get at food - which, as we're seeing, can include some pretty sophisticated strategies," Nelson says.